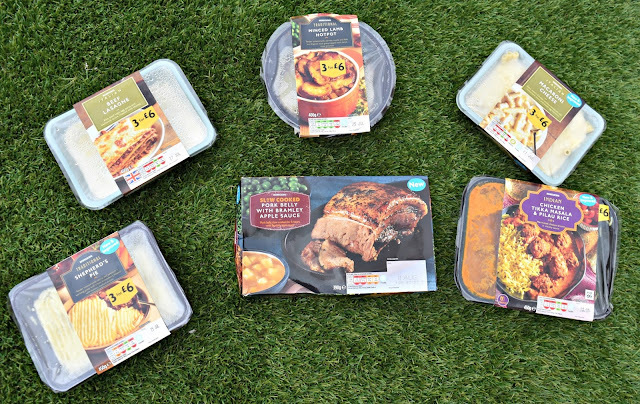 Recently we were asked if we would like to try some of the revamped ready meals from Morrisons. Generally ready meals would not be our go-to choice for evening meals and more of a rush choice or convience. Plus, some I previously tried were nothing exciting! However, the lovely folk over at Morrisons got in touch regarding their new revamped ready meals, asking if we would like to try some, why not?. So, we got to choose some meals from a wide selection within the range. Choosing the Beef Lasage, Minced Lamb Hotpot, Macaroni Cheese, Chicken Tikka Masala and Pilau Rice, Shepherd's Pie and a Slow Cook Pork Belly with Bramley Apple Sauce. Each of the meals we tried were delicious, full of flavour and definitely not bland like you generally expect from a ready meal. Each of the meals we cooked within the microwave apart from the pork which we did in the oven, however they came out surprisingly well. One thing I've found in the past is the Lasagne can sometimes be covered in grease however this one wasn't greasy at all which was a pleasant surprise. We teamed it up with some other food and it was definitely filling and full of flavours. One thing I sometimes find with pasta ready meals is the pasta can overcook and become hard however the pasta layers were soft throughout. We had a range of different meals from the different ranges, so we also had Chicken Tikka Masala and Pilau Rice. Having a 'take-out' meal as a ready meal can be hit and miss, and I for one can be very fussy with the flavours. But this one from morrisons was full of flavours and you could taste them with each mouthful. Simply similar to a take-out meal you would purchase. My overall favourite though from what we were sent was the Pork Belly, it was so tasty. I wasn't overly keen on the apple sauce sent within the pack however it wasn't disgusting either just not a flavour for me. The pork cooked beautifully, getting that slow cooked effect in much less time. Teaming with some vegetables it makes the perfect cooked meal within a hurry. The pork was tender just falling apart and so tasty. Definitely a winner for me. Overall, we loved the meals from Morrisons, the 3 for £6 option is a great deal especially with the amazing choice. Each meal was perfectly sized for the set amount as a lunch or added with vegetables for a larger meal. These would certainly be a ready meal I would consider to have again for those quick meals in which we all occasionally need. Please Note: I received the above meals in exchange for an honest review. All words and opinions are my own and not influenced in any way.